Visit our Facebook group page now! 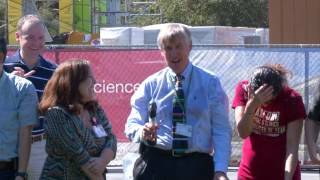 Representatives from Stanford's Neuromuscular Clinic, Neurosciences Department, Rehabilitation, Integrative Medicine, and the new Neuroscience building construction crew all participated in the ALS Ice Bucket Challenge. Appointments are available by physician referral only. Call us to reschedule an appointment or to schedule a follow-up appointment. Check in 20 minutes prior to your appointment. Bring records or films (preferably on disc) that are relevant to the purpose of your appointment. Bring a pen and notepad to take notes if needed. The length of your first appointment may vary. Diagnostic appointments take one or more hours. Returning patients or those with an existing diagnosis will see part or all of the multidisciplinary clinic team. These appointments last from one to three hours. To reorder a prescription, have your pharmacy call us directly with your prescription information. Unfortunately, it is not possible for us to see all patients who are referred to us. We screen all referrals to select those who will benefit the most from a consultation. Also, most of our clinics have a significant waiting period for new consultations. Please provide as much clinical information as possible so our staff may triage the referral to the appropriate sub-specialty clinic. We recognize that some patients may need consultation sooner than routine scheduling permits. Our doctors are happy to speak with you to facilitate urgent visits on a case-by-case basis. Referral letter or a description of the patient's medical history, diagnosis and reason for referral; include issues for us to address and any preference of neurologist or subspecialty clinic. Our coordinator will schedule directly with the patient. Our staff will usually call the patient within two to three working days of receiving the referral.